Thanks to this new feature you can get full ownership of any property even if somebody else created the account/property. When you will want to move a property to a new account. 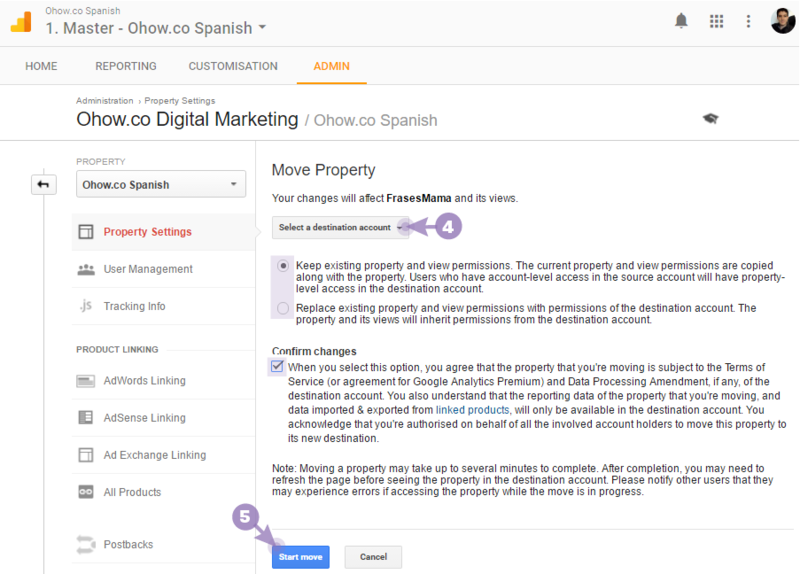 Some of the features in Google Analytics require permissions at account level even if you are applying changes to a specific property. If that account has properties for other clients, then they can't give you account level permissions because you'll get access to all those properties. Since properties couldn't be transferred, the agency would keep access to your Analytics even if you broke relations with them. Besides keeping them organized, having related properties on the same account have other benefits besides organization. For example, it is easier to create/update filters when properties are in the same account. Sometimes you have properties that you no longer use, but you don't want to delete because of the historical data value o or just because of your feelings to your first website :). Now you can create an account for those old properties and keep clean your active account. Things you should consider before moving your property. The process is painless, Google Analytics team did an excellent job to make the transfer as seamlessly as possible. The Property won't be duplicated it will be moved and most of the settings will be passed to the new account as is. There are a few things to consider though. The Tracking Code Number will remain the same so no need to make changes on the website. Settings and Configurations: Remarketing Audiences and Dynamic Attributes, Custom Definitions, Data Import, and Custom Tables. Assets in the views: dashboards, custom reports, annotations, segments, and goals. If there is a filter with the same name, the configuration from the destination account stays. Filters are copied not moved, so don't worry about losing your filters in the original account. Linked Accounts and Integrations: AdWords, AdSense, Ad Exchange, etc. the only exception is DoubleClick for Publishers (DFP). 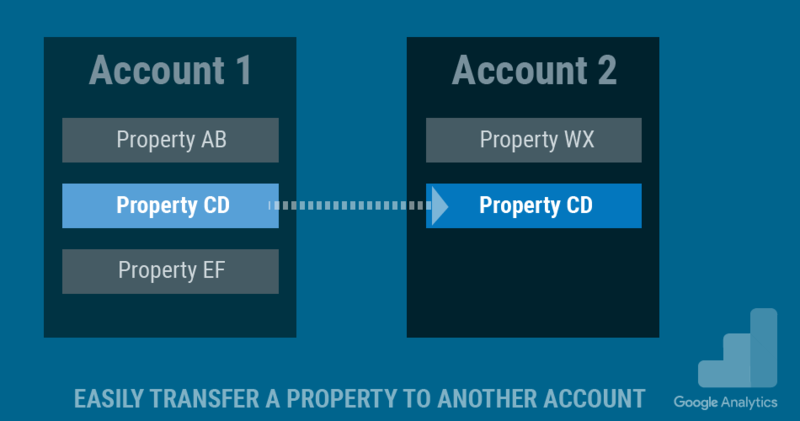 If your account is linked to DFP, your first need to unlink the property and once it's moved link it again. Billing (Only for Google Analytics 360 and Google Analytics Premium), the destination account gets billed from the current month. You need to meet a few requirements to be able to transfer a property to another account successfully (nothing complicated). First and most important you will need the permissions Manage Users and Edit in both the current and the destination account. Have less than 50 properties in the account of destination. The property you want to move shouldn't be linked to DoubleClick for Publishers (DFP). If it is, you should contact your Analytics representative and unlink the property. Once the property is moved, you can link it again. If you meet the requirements then you are just a few clicks away from moving your property. 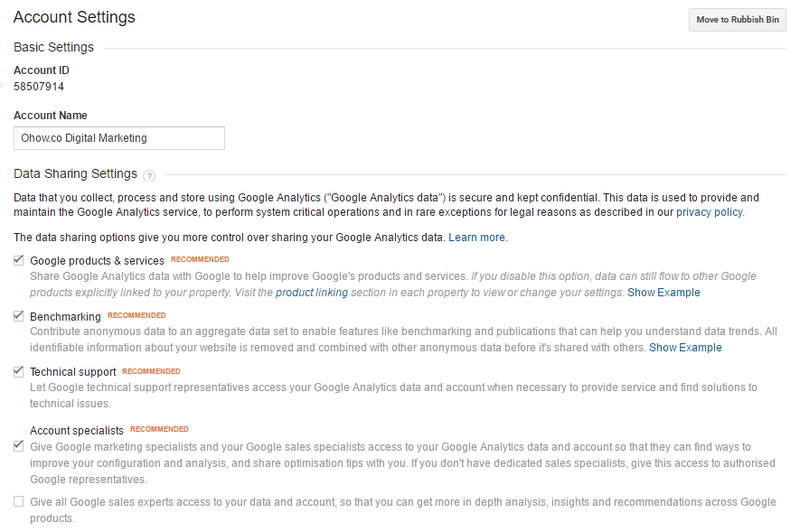 Go to the Admin section of the Analytics Account with the property you want to move. Select the property you want to move (dropdown) and click Property settings. Click the button Move property at the top right corner. Select the destination account from the drop-down and Choose between keeping user permissions or replace them check the box Confirm changes. You must have Manage Users and Edit permissions on the destination account to move a property into it. Click the blue button Start move.You will probably get a Warning saying: "The current account and destination account have different Data Sharing Settings..." Just click Confirm, this is the data you share with GA; you can adjust these settings at any time (see below if you need help finding them). Note: If you get the message "internal error" while moving properties. Close your current window, clean the cache of your browser and try again. That's it, in a few minutes the property should be transferred. 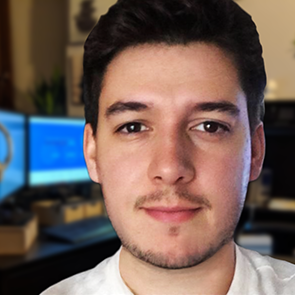 Remember to notify all the users of the property you moved it because they might get errors accessing the account while the transfer is in progress. To find and change the "Data Sharing Settings" on the destination account, go to the admin section and click on Account settings (first column). And check/uncheck the data you want to share.